Marvel's Agents of S.H.I.E.L.D. - How Did You Like It? Thanks to Jennifer at the Florence-Lauderdale Public Library for inviting us out for the premiere of Marvel’s Agents of S.H.I.E.L.D. last night. We had a blast! It’s always great to see people come out and support a local event, do a little cosplay, and grow their geek communities. Again, thanks Jennifer and Florence-Lauderdale Public Library! So….just how was the premiere of the most anticipated TV show in years? The consensus between Jared, Brandon, and myself (plus Cassie and Christina!) was that overall this was a pretty good start! 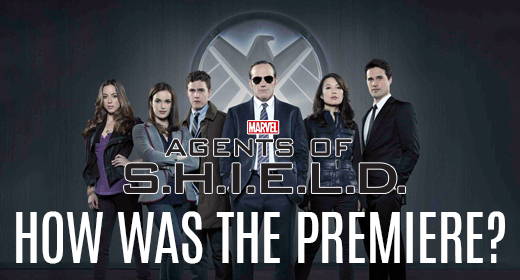 While we’ll save all of the details of the premiere for our next podcast, S.H.I.E.L.D. did not disappoint. The action was great, and while it didn’t feel like I was watching a mini version of Avengers, it was pretty much what we all expected from this episode, and the series. We want to hear from you: did you love or hate Marvel’s Agents of S.H.I.E.L.D.? We’ll happily feature your comments and opinions on Episode 79! Loved it the story was quick and a good simple premise. There are a few unknowns and mysteries but the whole show isn’t built on that. Coulson was great and his interaction with the team was solid. @JustUsGeeks shield was a good start. Looking forward to seeing it grow. I am looking forward to s2 of revolution!